Hana is a second grader at Urban Montessori Charter School in Oakland. An avid maker, she owns Little Maker Pens on Etsy with her brother. Her father, Parker, works for Make. 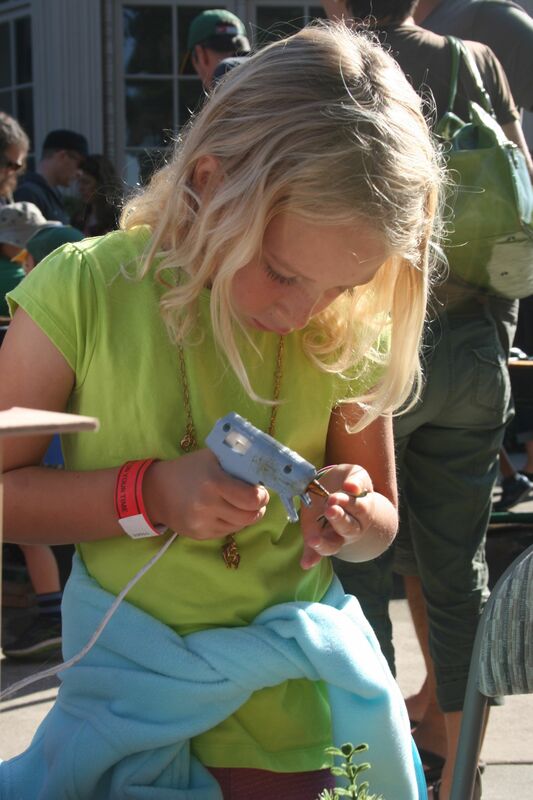 Sunday was the East Bay Mini Maker Faire at Park Day School. I liked the fair because there were lots of activities for kids to make and do things – even more than the big Maker Faire in San Mateo. My favorites were Riveropolis, Nerdy Derby and Hoop Play. I also really liked the crate stacking. The Riveropolis exhibit is a man-made river with rapids and whirlpools – all at chest height for kids. It is a magnet for kids. Kids can make boats from corks, wood, rubber bands, and lots of other materials to support plastic dinosaurs putting down the river. There are several floating islands on which you can make miniature treehouses for the dinosaurs and other imaginary small people. The tree houses are built on stilts and embedded in grass islands or foam. This is my friend Hattie making a tree house. Nerdy Derby is sort of like Pinewood Derby for Boy Scouts, but without any rules. The track was set up on the Park Day school playground with a big hump that made many cars fall off. It seemed to be run entirely by kids. The announcers were kids and so were the people maintaining the track. I liked nerdy derby because I got to make my own car and then race it against my brother and his friend (I finished second). 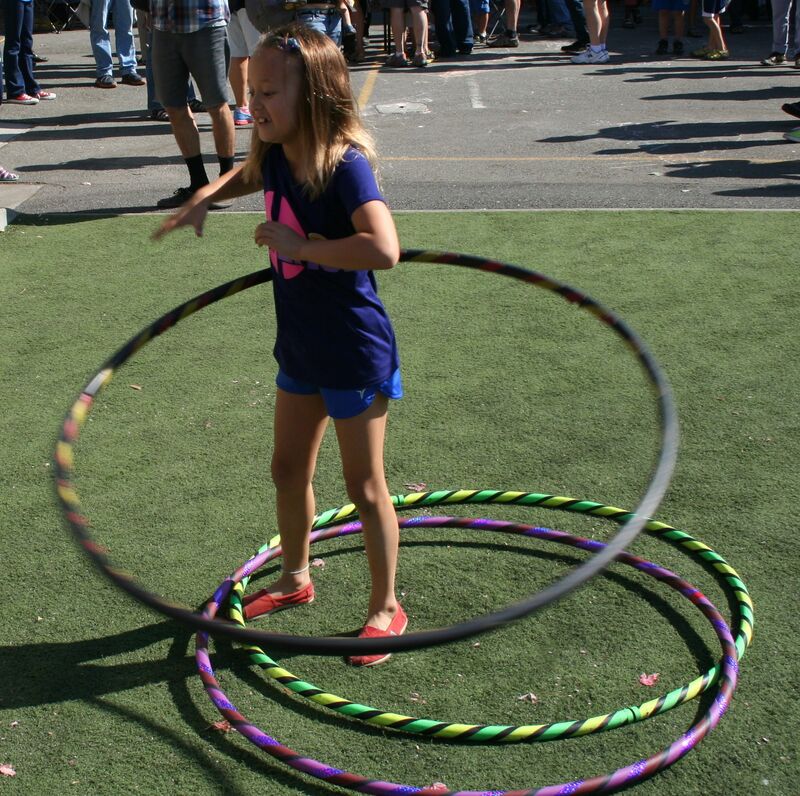 At Hoop Play, Choi taught me how to to transition from standing and kneeling and standing again while hula hooping the entire time. She also showed me how to hula hoop with three hoops at the same time, though that did not last quite so long. I need more practice (that’s me below). I’d never seen crate stacking before. You have to stack milk crates as high as possible without falling over. It looks really hard because you have to keep your balance on top of the crates, which start swaying after eight or so crates. The stacker wears a climbing harness attached to a crane – there is no way to fall. But it looked pretty scary. We saw someone make it to 17 crates without falling. Kids as young as 10 were making it pretty high. It was lots of fun to watch. My papa captured the sequence below of someone leaning too far and falling. It was a great day. We stayed for six hours. I look forward to next year.